From MACRA to certification to the latest iteration of what was formerly known as Meaningful Use, there never seems to be a slowdown of activity in the world of healthcare IT policy. Of course, with that activity comes lots of very complicated questions. Well, we’ve got the best in the business to provide the answers. 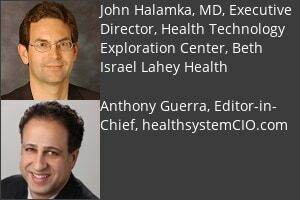 In this invaluable webinar, John Halamka, M.D., CIO at Beth Israel Deaconess Medical Center, will brief you on the latest policy developments and offer thoughts on how you might go about tackling them. With so much riding on staying in compliance, this is truly one educational session you can’t afford to miss. Like it or not, much of your agenda is governed as much by the folks in Washington making policy as the folks in your C-suite meeting or board room making decisions. With that reality in mind, it’s critical you understand not only the byzantine details of what’s been put into place but what’s coming down the pike. In this quarterly series, you’ll get the latest information and all your questions answered around issues of policy and other emerging technologies such as blockchain. Interested in learning more about our advertising programs? Visit our Advertising Portal or subscribe to Director of Sales & Marketing Nancy Wilcox’s (303-335-6009) Marketer’s Bulletin for the latest offerings and programs.